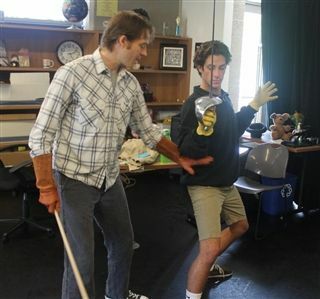 Stage Combat Expert Gets Students "En Garde"
Last week, Advanced Acting students engaged in combat. Threatening eye contact was made, fists were thrown, swords were brandished. Even Theater Arts teacher Fredreka Irvine couldn't resist getting in on the scrap. The aggressive-looking but harmless melee was the work of Benjamin Cole, a professional actor and fight choreographer. Cole, a member of the Society of American Fight Directors, instructed students on how to heighten physical tension on stage without sacrificing believability or actor safety. During a three day master class on stage combat, the group learned the proper technique for slaps, punches, foot stomps, sword fighting, and more!